Bak Mei played an important part in the downfall of Shaolin temples. Manchu took control of China in 1644. Before then, China had been ruled by the Ming Dynasty, which had been weakened by internal corruption and rebellion. The Manchu dynasty became known as the Qing Dynasty. As part of the Manchu campaign to control the Middle Kingdom, they attacked some Buddhist Shaolin Temples. The leader of the Shaolin Temple, Hong Mei ("Red Eyebrows") died, leaving his legacy to Chi Thien Su, also known as Jee Sin, one of the five Great Kung Fu Masters. According to some stories another such master, Chu Long Tuyen, the monk who would later become Bak Mei, did not accept this. He believed the Ming had become corrupt and Chi Thien Su would still serve them; Bak Mei would rather serve the Qing Dynasty. Then came the attack against the Shaolin Temple at Quanzhou in Fujian province in 1647. Some sources indicate that this temple was actually in Henan, or that the invading forces recruited help from Tibetan warriors in the attack. 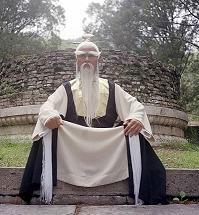 The Five Elders survived, however, and soon Chi Thien Su would found a second Shaolin Temple at Nine Lotus Mountain, also in Fujian Province. The Five Kung Fu Masters survived the first destruction of the Shaolin Temple by Qing Imperial forces and sought shelter in another temple, Fujian Temple, but the other monks were massacred. After Bak Mei refused to provide his real name for fear of retribution (against his family and students - if they survived), the Abbott of the temple christened the monk "Bak Mei" - White Eyebrow. According to some stories, Bak Mei betrayed the Ming at this point, taking information about their plot against the Manchu to the Manchu Shunzhi Emperor, then returned with information about the Manchu attack plan to the Shaolin. After the temple was destroyed by the Manchu, Bak Mei and Fong Toh Tak (creator of the Bak Fu Pai) left the temple on separate paths in order to study Taoism. Bak Mei trained an anti-Imperial attack force but following capture of the force by the Imperials, was forced to teach and lead 50,000 Imperial troops in the second destruction of the Shaolin Temple at Henan to prevent those captured with him from being tortured and killed. There, Bak Mei slew the "invincible" Shaolin leader, Chi Thien Su, in single combat by breaking his neck. He claimed he did this to prevent the massacre of the monks in the temple by the troops who followed him. The tale of Bak Mei's death comes in many forms - it is often claimed that he was poisoned, or slain (in a grand battle) by other martial artists. Bak Mei is often portrayed as a traitor, however, it is important to note that Bak Mei's actions are not always consistent with this. Bak Mei's actions were undertaken, even to the destruction of the temple, with the intention of preventing harm to those who had chosen to follow him. It is possible that if Bak Mei had not aided the Imperial forces, his followers would have been tortured to death.